Discussion in 'Downhill & Freeride' started by demo 9, Jan 14, 2008.
the bike is a demo 9 from 2005.
canecreek double barrel is NOT an option. i was thinking about the DHX air but it is expensive and i heard it rides well but will blow out really easy. the 5.0 is the cheapest and although i dont like it on my other bike it gets thejob done. what is the TST r and what does it do, also anybody with opinions please list them because i dont know much about this type of thing. roco world cup will do what u need it to. 5.0 dhx or woco world cup. i'd say the dhx 5.0. would probably feel better paired with your fork. that being said, you'd be fine with either option. Would that new Rock Shox Vivid be a viable option? They're cheap, and SRAM (besides Tony, apparantly) has a pretty good warranty department. Plus Chicago is closer than CA if you need to send things back for some work. Buying stuff hot off the press has never gone well for me, but it is another option. I'm not taking the piss here, but can you really 'match' a rear shock to a set of forks? Surely the bike's suspension design has more input than brand-name matching...? Or does a fox/fox or marzocchi/marzocchi setup feel more balanced? Not riding the 303 anymore? The Roco TSTR and World cup are'nt that much different from each other, just more adjustments on the world cup. Surely the bike's suspension design has more input than brand-name matching...? ? WOW, exactly what I'm experiencing it seems like it just blows right thru the stroke and the rebound is for ****. I thought I was goofy. That might be true but their basically the same. how long have you been riding the shock? have you changed the oil yet? this is crucial to performance on these shocks. its recommended after every 50 hours of riding. another critical thing i've discovered is re-setting the piston for the air chamber to the proper depth, otherwise everything feels all fvcked up like you're describing. ITS been ridden twice once at snowshoe and once at wisp. But what do you mean by re-setting the piston for the air chamber to the proper depth, is this something that I can do and do I have to take the shock completely apart. yea you have to take the schraeder valve out of the reservoir to access the air chamber piston. its something you do during the bleeding process. there's a floating piston with a bleed valve on it that separates the hydraulic part of the shock from the air chamber. this is how you adjust your BOR, and also affects when the shock ramps up. are you running it with enough air pressure? my world cup needs at least 180 psi or it doesn't work properly. if you've only ridden it twice, maybe it needs some oil (the common marzocchi problem; i had to do this to my world cup when i got it). what weight spring are you using? are you sure its not oversprung for your weight? I know for sure its not oversprung, I'm running about 125 psi in the shock but I don't have a world cup I have the tst r, should of got the wc I don't care about the platform, How many cc of oil are you running. I really appreciate the help thank you. ok there's the problem. I checked the spec's on marzocci's website, the TST R needs 180 psi in the air chamber as well. bump it up to that and let me know how it feels. for cc's of oil, it depends on where you set your floating piston in the reservoir. i never measure because when i change oil I do it in a full submersion bath (takes a lot more oil than you need [it can be re-used if you're careful], which is pricey - I have a gallon of Redline superlight - ran me about $70) , its the easiest way to ensure that you don't get any air in the shock when you bleed it. Sweet, mind if I pm you on some more info. I like full submersion. i think they are the same too, all the tst does is goes from max to min setting much quicker then the world cup. and this is on the compression shim stack in the piggy back. No one has ever blown an Avalanche. 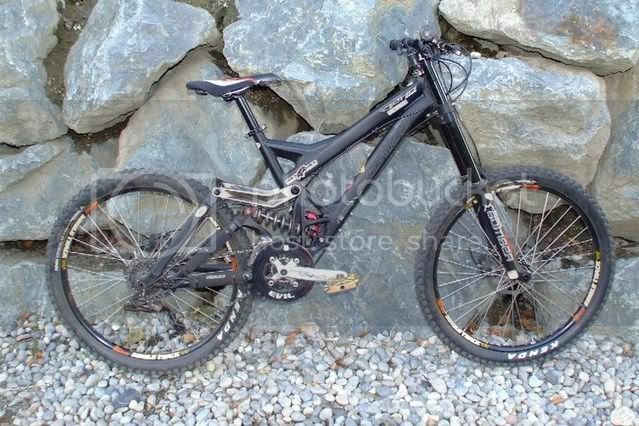 I have the same bike (05 Demo9) with an Avalanche DHS and its totally rips. Everyone who sits on my demo says the same thing, this bike is so freakin plush. The Avalanche Montie shock costs $399 about the same as a DHX or Roco and is about 1000X more durable. I would also check your bearings. On a demo end of the shock runs without shock eyelet bushings and instead rotates on a bearing. If this bearing has seized it may be causing the shocks to fail prematurely. how did your shox blow up? i would go with the dhx because it has a much bigger adjustment range then the roco. i say that because i have already re shimmed a couple of rocos to suit different bike from its stock settings. with a dhx you dont have to open it up. I can give you guys a review of the vivid in about two days, bushings should be here tomorrow. in regards to shimming the roco, what changes to the shim orientation brings about what results? this is one thing i haven't touched in my roco and i've been curious to try it. would like to get some insight as to what effects to expect based on the changes. umm, the most simple way i can put it is more shims=more damping. big shims at the bottom of the stack affect low speed damping and smaller shims at the top of the stack effect high speed damping. also another thing is to watch out is the thickness of the stack, thinner will give less damping. try and think of it as a leaf spring on a car. otherwise just do some reading on the net, there is loads of info. one thing you might want to do before you changed anything is note the orientation of the stock shims stacks so if you mess up you can always go back to that setting. also try to change one thing at a time otherwise you wont know what change does what. otherwise, have fun and post back your findings. cool beans thanks for the heads up. its more of a rule of thumb when it comes to the shim stack eh? Please do! I´m really curious. otherwise just do some reading on the net, there is loads of info. Do you have any good links? thats the control valve not operating properly. most of the time its just because the air pressure is too low. what kinda pressures do you run and what was actually done to fix it 5 times? otherwise the control valve is stuck down. jon, unless you have a nice shiny dyno you will never know precisely what is going on. one thing that i did when i started is try one extreme then go to another, that way you will get a good feel of whats does what. makes for a good laugh too. i shimmed my shox to have no low speed compression at all. took the bit hits well, absorbed every tiny bump and was butter, but come high speed sections it would sit so low in its travel is was horrendous. Damn dhkid you really are a Turbo Monkey. Quick ? when you said you don't have to open up the DHX for I assume shimming does that mean the fox does'nt have a shim stack? the shim stack he is referring to is for the roco. IIRC all dampers have a shim stack. i just wouldn't open up a DHX. not to mention it voids the warranty. the roco was designed to be user serviceable, and there are exploded diagrams floating around the internet too. i work from a computer, i get distracted easy. the dhx has a shim stack and a variation of the control valve. this makes it both speed sensitive and position sensitive. this makes the dhx very adjustable from the external adjustments. the roco on the other hard has kinda weird tuning range, the rebound adjuster doesn't make much difference till the last few clicks. and for the bike i re shimmed the roco, it had way too much compression. the compression adjuster does work well, but it is a compression adjuster more then just a low speed adjuster. jon- the dhx is as easy to work on as any other shox. yea it voids the warranty, but it's only for a year anyway. psh who uses a shock longer than a year anyways? you have just made a marketing guys day. but yea, you're right. at least there's no "planned obsolescence" when it comes to shocks. that i'm aware of that is. Demo 9 I ride a the same frame but with a 888 check the link http://www.ridemonkey.com/forums/showthread.php?t=159881&highlight=evilbob for fitting a ROCO to your frame. There are kits available now but if you can't find one all is explained. My Demo currently has a ROCO Worldcup on it and it is perfect!